Everything seems to be growing well, now. Even though it is still spring, things seem to be settling in, with warmer temperatures not too far away. This weekend I will pull out the rest of the pansies. They are starting to get very rangy and not blooming as well as just a few weeks ago. The petunias are doing okay, but it will not be too long before the heat will be too much for them, and they, too, will have to go. I can’t complain though. Both the pansies and the petunias have been in since October. That is a long season for annuals to stay around. This weekend I’ll probably start planting a few summer annuals. I have started planting more perennials that bloom in succession so that there is color all year in the garden. Every year I am having to plant fewer annuals. There are, of course, some annuals that I think I will always plant because I like them so much. Coleus comes to mind, as does that workhorse for the shade garden, impatiens. I am already planning what perennials I want to plant next. 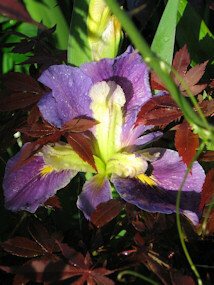 I’m looking for more LA Irises like the above photo, more daylilies, more amaryllis, and more flowering perennial vines. So it seems like in the heat of summer I’ll be planning what I need to plant in the fall. I haven’t been growing crinums for too very long. I have really had success in the last two years since the garden is getting a lot more sun. I received my first crinum from my sister. I kept it in a pot for a few years so I could place it in some sun. About two years ago, I planted it in the ground, and boy did it take off. 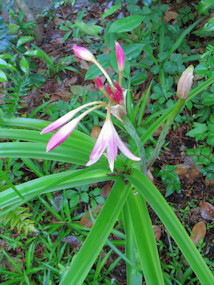 It has not sent out any blooms yet this year, but a little crinum I have in the back garden is already up and open. This particular crinum was on my sister’s compost pile about three years ago when I saw it and asked her if I could have it. I brought it and an even smaller one home and planted it in the only place that got any sun. Well, it didn’t die, but it sure didn’t thrive. 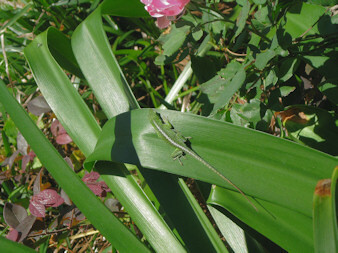 After Hurricane Katrina came through and knocked down some trees in 2005, more sun was available for these two crinums. In 2007 I got my first blooms from this scrawny plant. I was thrilled because I love the color, and, hey, an easy care plant that blooms just can’t be beat. Well, with a little compost, fertilizer, and watering, I think this crinum will soon be on its way to being a lot bigger with more blooms. The clumps of crinum lilies can be quite large. The strap-like leaves can be up to four feet. These are big, bold plants. 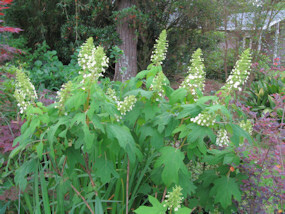 The flower spikes rise up to about three to four feet and display fragrant trumpet-shaped flowers. These can be grown into zone 7 and some varieties to zone 5 with protection, but down here you can hardly kill these things. As I am moving to having more and more perennials in my garden, I will make sure to leave room for this great old Southern bulb. I have always preferred the “cool” colors on a color wheel. The greens, blues, violets. This is reflected in my garden. I don’t know if it is in response to gardening in a hot, humid climate or not, but those colors all seem to make the summer garden seem cooler. While I love flowers, foliage is just as important. That is one of the reasons I love hostas and ferns. This hosta is Blue Cadet. 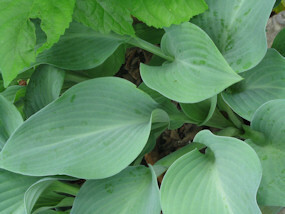 The blue hostas are not known to do well in the hot, humid South, but this one has been successful for me. It keeps its blue tinge pretty much all summer long. I do keep it in the shady areas where it may get only a few hours of early morning sun, and it stays well-watered. 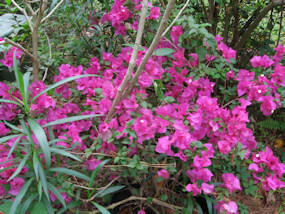 This bougainvillea was obtained from a neighbor who moved and couldn’t take this large plant with her. It, too, is a “cool” color. This is the best it has looked since I got it in late 2005. It sits in front of an azalea border, and the green background really makes the fuchsia color pop. This is a bright color, but still lends a cooling feeling to that area of the garden. “Hot: colors are present in my garden, but they have been used more to complement a surrounding area rather than as a personal preference for those colors. Even when reds or yellows are in the garden, I always have some blue or purple to tone them down. I love to look at “hot” tropical gardens. They can be very striking, but for my home garden, I’ll have to stick with the “cool” colors. 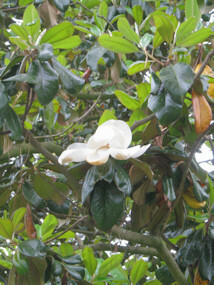 One of the signature plants of the deep South is the Magnolia grandiflora. This majestic, evergreen tree has large, glossy dark green leaves and huge, fragrant, white blossoms. Every thing about these trees is big. These trees are big – 60 to 90 feet, the flowers are big – 12 inches across, and the leaves are big – 8 inches long. The cones that come after have shiny, bright red seeds. We did not plant our tree, previous owners did that for us. However, this giant of a tree must have room to grow, and the planters of our tree put it too close to the house. 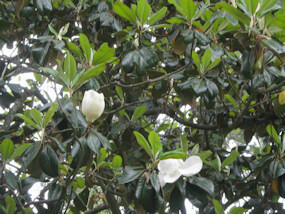 It does give us welcome shade in the summer, but there are problems with this magnolia. Nothing grows under it. Shallow roots are exposed making it difficult to walk around this tree. As it grew larger and grass was dying out in an ever expanding area, I decided to make the entry garden. The shape of which was determined by magnolia shade and root area. So far things are working out well. Another problem is the falling leaves. They are large, leathery and never seem to decompose. It seems as if things are falling out of this tree nine months of the year. First, it is the leaves. As new leaves come out in the spring, older leaves drop off. By the thousands. A mulching lawnmower takes care of the ones on the lawn, but in the garden where they cannot be raked, I have a stick with a nail on the end and pick each one up. Next, comes the thin outer sheath of the flowers. These will decompose rapidly, but still are unsightly on a newly mown lawn and freshly swept walkway. Lastly comes the cones. These are not large or spiny, but stepping on one is not pleasant. So, with all the above negatives, why would anyone plant one of these trees? If they are planted as a specimen, free standing tree, there is nothing lovelier. The leaves tend to fall straight down around the trunk and would not have to be raked often. Several homes in our area have them planted out in the yard and never have the problems with debris like we do having it close to sidewalks. The showy, red seeds attract birds and are eaten by squirrels. This makes a wonderful shade tree planted in the right spot. The flowers and large leaves are often used for seasonal decorations and floral arrangements here in the South. Either left their natural green or sprayed gold or silver, these leaves are used in door, mantel, and stairway swags. So while this can be a high maintenance tree, it is extensively planted for its large, saucer-shaped, fragrant flowers and large evergreen leaves. It can be grown to zone 7, and some new varieties are said to survive to zone 5. Low care is also another plus to this tree. No spraying or extensive pruning, etc. is needed. This is the state tree of Louisiana and Mississippi, and throughout the South there are many people who find this evergreen tree to be very splendid tree indeed. The last two days I have been really working hard in the garden. Yesterday, I planted five white lacecap hydrangeas, a least a dozen asters and transplanted a Stella d’Oro daylily. The hydrangeas were ones I had rooted two years ago and had kept in pots until they were large enough to plant into the garden. When I had trimmed back my mophead & lacecap hydrangeas in late June, I made about 40 cuttings to try and make some more plants. I used the mister setting on the hose nozzle to mist the cuttings about twice a day. I know that professional nurseries use misters to propagate cuttings, so I thought I’d try it since I had nothing to lose. I never expected all of the cuttings to take, but they did. I had pink mophead & lacecaps as well as the white lacecap. I have shared these with my mom, sisters, and daughters. I think this year, I will try some white mophead cuttings (but not as many) to see if these will be as successful. The asters were from my mom. When she went to clean out a bed last fall where she had planted asters the year before, she found that the original plants had sent out babies. She plucked them out of that bed and put them into two large pots and kept them through the winter. She said she could not use them all, so I got to take some home. I planted most in the circle garden and a few in the entry garden. Hers did well in her garden, and I regretted not buying some when she bought hers. I am looking forward to having them make a nice fall display. I transplanted a Stella d’Oro daylily that was being shaded by the Louisiana Irises. It wasn’t doing too well, so I moved it where it will get more sun. The other Stellas are blooming their little hearts out, so I am hoping this one catches up. Speaking of the circle garden, I noticed my Texas Bluebonnets have set seeds. Maybe I won’t have to buy seeds this year after all. They look great in combination with the yellow of the Stella d’Oro daylilies. Today, I started redoing the patio garden. That meant digging out lirope that had encroached too much into the bed. It was crowding the hostas and ajuga and a few other things. I also started cutting back the holly fern fronds that have yellowed. Leaning over that much wasn’t so great for my back. Finally, I had to watch dear hubby clean pine needles off the roof. We have a two story house, and I’m afraid he’ll fall if I am not there to watch him. I picked weeds while he worked. After he dumped the pine straw, he and I picked it up. We finished just as the rains started. A hot shower was welcome relief after all the exercise of the last two days. I think tomorrow will definitely be a day of rest. No pictures today, I can’t seem to upload them & can’t figure out why. Today, I was able to catch up on some blog reading, and was struck by the tremendous difference in what is blooming between my garden and the gardens of the North. There, daffodils, tulips, and other early spring plants are blooming. Here, early summer seems to have almost arrived. 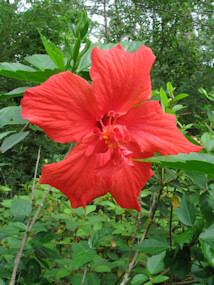 The tropical hibiscuses have started blooming. The peach colored were first, and now the red ones are blooming. The yellow have buds and should be opening in a day or two, and the pink ones have just started showing buds. The salvia van houttei has a few blooms already. 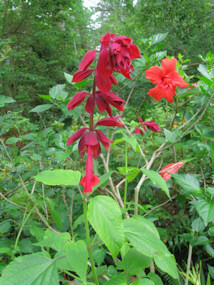 This is early for this deep burgundy-flowered salvia to bloom. It usually starts showing off color in late summer. This salvia gets to be very large, about four feet. Once it starts blooming, it keeps it up until frost. I always make sure to over-winter this plant because it is sometimes hard to find, and I love the deep color. It seems like only a few weeks ago, the oakleaf hydrangea was showing its fall color, and now, look at the blooms. The color is just starting to show on the stalks. In another week, I fully expect to see the panicles completely open. The weather forecast for parts of the north is even calling for snow in some places and freezing temperatures in even more areas. It is amazing that I am trying to hurry up and finish working in the garden before the hot weather sets in, and just a few hundred miles away, there are gardeners longing for warm weather to hurry up and settle in for good. Have you ever had something work out so right without your even planning it? Well, I have been lucky to have just that happen to me. I have three Iceberg roses that have just started blooming. 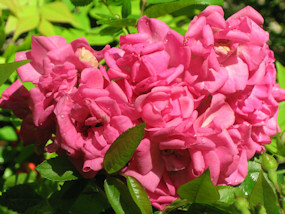 When the weather is cool, these roses tend to have a pink tinge when they bud and just start to open. Since I have them in my “white garden”, this never really bothered me, but I would have preferred them to just be white. This isn’t an issue in the summer when the weather is much warmer. 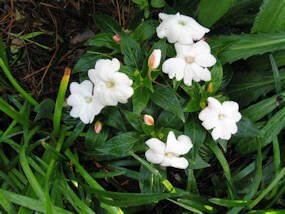 Two weekends ago, I started pulling out some of the white pansies and violas in that area, and I put in some white New Guinea impatiens. I just noticed that they have started to open in the last few days. When I went to take photos of them for the blog, I couldn’t believe it. They had a pink tinge to them also. I know this isn’t really a big deal, but just having these two plants both have the same coloration lends some continuity to that section of the garden. And to think, I didn’t even plan it to work out this way. Every now and then, things just have a way of working out without any help from anybody. It’s amazing that creatures we never want in our homes are more than welcome in our gardens. When I first started installing garden beds around our property, I was only concerned with plants. I did not realize then, that nature is not just plants. It was not too very long before I noticed my first baby anole. It was then that I realized that my garden was lacking creatures. No spiders, no anoles, no bees – just plants. I figured that they just had not discovered the new garden yet. To get to it they would have had to cross open lawn. Gradually, the little critters found the garden. Bees, spiders, and anoles found refuge there. Praying mantises and ladybugs also showed up along with slug-eating beetles. These beneficial insects and reptiles keep the baddies at bay. One of the benefits of a wild life friendly garden is that it discourages pests. I do not spray pesticides because I don’t like the chemical idea, but also because I don’t need too. There must be a large hidden army of predatory insects and reptiles around. Because I really have been able to attract the predators of so many common garden pests, I have had very little problems in that department which saves me time and money. Bugs and reptiles work for free. Mother Nature really has helped me keep my plants healthy and bug free. There are not too many trees that have a lot of leaf color this far south like they have in more northern latitudes. We do not get fall color except from the occasional tallow tree, and in the spring we don’t have the red maples, etc. So there is never that spectacular show that others have. Of course, we do have flowering trees, but people do not seem to plant them in groups to make a statement, just one here and there. That is why the Japanese Maples (acer palmatum) are becoming so popular around here. This is a tree that will give a great springtime display. Just a small one in a corner can call attention to that area. The Bloodgood cultivar is the most popular because it holds its color better and is a pretty sturdy little tree. To keep your Japanese maples growing healthy; the best time to fertilize them early in the new year when they are still dormant. Japanese Maples have less stress and grow more vigorously when planted in full sunlight for the morning and early afternoon. Japanese Maples are healthier and have better color retention when protected from the hot afternoon sun esp. in the South. I am going to have to watch mine this year as the Japanese Magnolia that was protecting it from the western sun was cut down because of a late spring storm. This versatile tree is a slow grower and can eventually reach twenty feet. If they need to be pruned, I’ve read that they should not be pruned in spring because they bleed. Wait until late summer or early fall to prune. I’ve never had to prune mine, so I don’t know how accurate this is. This is a great tree for any landscape. It doesn’t grow too big, has great color, and is hardy to zone 5. 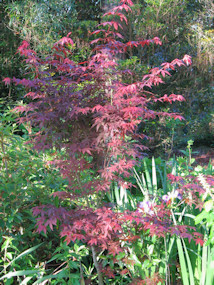 So if Earth Day has you thinking of adding a tree to your patio, yard, or garden, consider the Japanese Maple. You won’t be sorry. My mother rooted a climbing rose for me several years ago. The family is not sure of the name, but I believe it is Climbing Blush – it is a lighter pink in person (I think digital cameras have problems with some colors). It was very popular in the ’60’s. In fact if you drive through neighborhoods that were developed then, you find this rose in every block. It is very floriferous and easy to care for. I don’t spray it, and it rarely has a problem with black spot. The canes can get quite long and need to be trained on some kind of support. My mother has rooted several of these roses and given them to friends and relatives. I have two she was able to propagate. 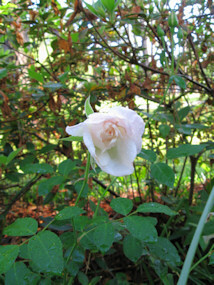 This rose is a repeat bloomer, blooming in flushes. Though the older it is, the more it seems to rebloom. My mother’s is spectacular. She has three around her house. I have not been successful in propagating roses, however I did succeed with this one, and now my daughter has one for her garden. I can’t really take credit for rooting this one. 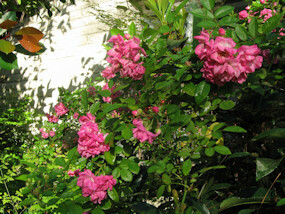 The spring after Katrina, my dear hubby and I were replacing the damaged arbor this rose was on. A long cane (about 25 inches long) broke off as we were trying to weave the canes into the new arbor. Since the rose was in bloom, I wasn’t about to just throw away all those flowers. I put this long cane into a large, green vase and put it on a table on the patio. It continued to open blooms and made a very lovely display. After about three weeks ( I was very busy that spring), even though there were still viable looking leaves on it, I took the cane out to throw away. I could not believe my eyes. There were roots everywhere the stem was in water. I was shocked. I didn’t think you could root a rose this way. I placed it in potting soil and kept it watered. It didn’t die. It continued to grow. I couldn’t believe it. After about six months, I offered it to my daughter to plant in her new garden. Now, she, too, has an offspring of grandma’s rose.